Amazing how things have changed . . . This year Emory is observing the centennial of its university charter (replacing the 1836 charter as a college) and celebrating a hundred years of making Atlanta its home town. How to measure change at a place during a century? There are many ways, but one is to look at some numbers at the beginning, midway, and now. For instance, in 1915 Emory conferred 148 degrees; in 1964-65, 1,136; in 2015, more than 4,600. In 1915 there were 61 members of the faculty, including 16 in Emory College, which was still in Oxford. There were no endowed professorships. By 1965 the faculty had grown to 200, with twelve endowed Charles Howard Candler Professors and three or four other endowed chairs. This year there are more than 3,000 full-time faculty members, about half of them in the School of Medicine. Nearly 200 faculty members hold endowed professorships. In 1915 the enrollment of the entire university was 631 students; in 1965 that number had grown to 5,844; this year it is 14,769, with students hailing from more than a hundred countries. One literally concrete measure of what has happened at Emory since 1965 is all the facilities that did not exist or were not owned by Emory fifty years ago. 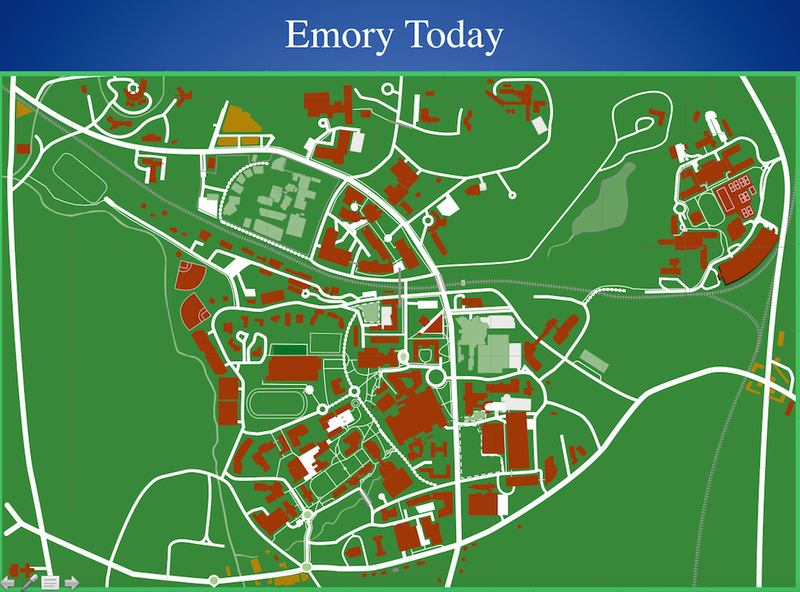 Here is Emory as it is today. This map of the main Atlanta campus does not include the Briarcliff property and, of course, the historic and still vibrant campus at Oxford. 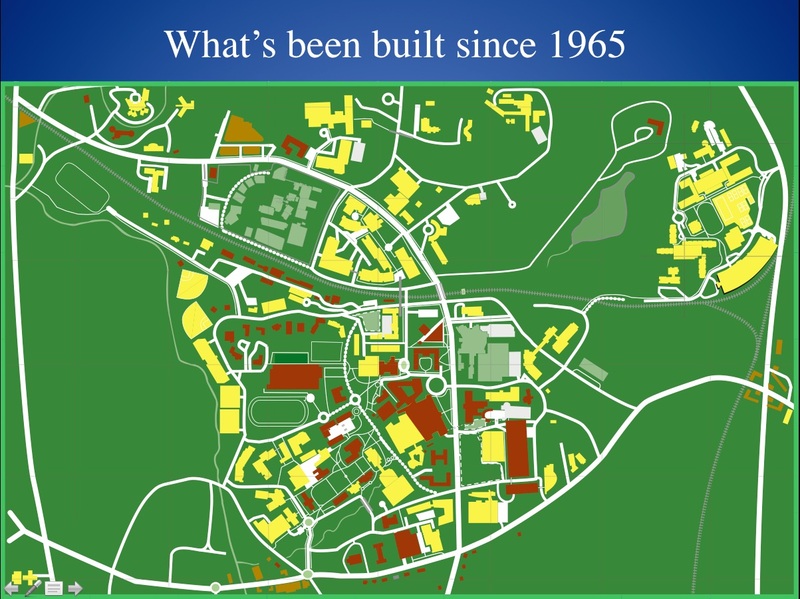 Here is the same map indicating all the buildings that Emory has added since 1965. All of those yellow shapes are buildings that did not exist in 1965. No wonder alumni sometimes don’t recognize the place when they return! If I printed the list here the names of the buildings would number more than fifty—more than one building a year for the past 50 years. And this does not include the new library, science center, and three new residence halls at Oxford (and the new dining hall under way there), or the nine-story hospital bed tower going up on Clifton Road, or the renovation (sometimes twice) of everything that previously existed on both campuses. What these maps highlight is the increase in scholarly activity, teaching activity, and social activity that makes a university a university. I’ll include more measures of change in future posts.